Circuit de Nevers Magny-Cours GP is a racing venue in France with 35 laptimes.This page represents the 4.4 kilometer (2.7 mile) configuration of this track. 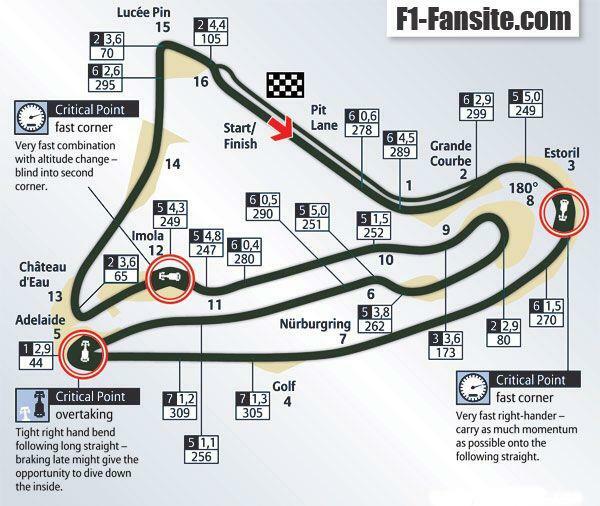 Circuit de Nevers Magny-Cours GP is a moderately fast track, with overall average speed of 137 kph (85 mph). how did the performante beat the gt2 bs ? The first 7 times are for the shorter Magny-Cours club track. The first 3 times on this list are obviously for a different track. the Lap time for the Cadillac, Alfa and M3 Competition package isn't possible. It's the lap time on Magny-Cours club! @FastestLaps - Turns out a customer 675LT previously ran by the magazine was a second faster on a different day. "Sur la piste club, la 675 essayée en début d'année avait été plus rapide de presque une seconde"
@FastestLaps - Driver for MotorSport Magazine laps was Romain Monti.